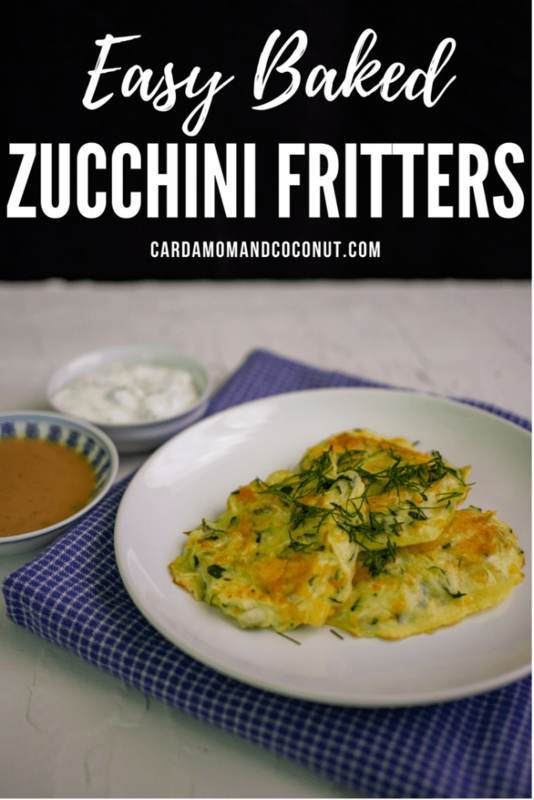 These 5-ingredient, easy baked zucchini fritters are the perfect summer recipe to showcase fresh zucchini. [social_warfare]This post may contain affiliate links. See my disclosure policy here. 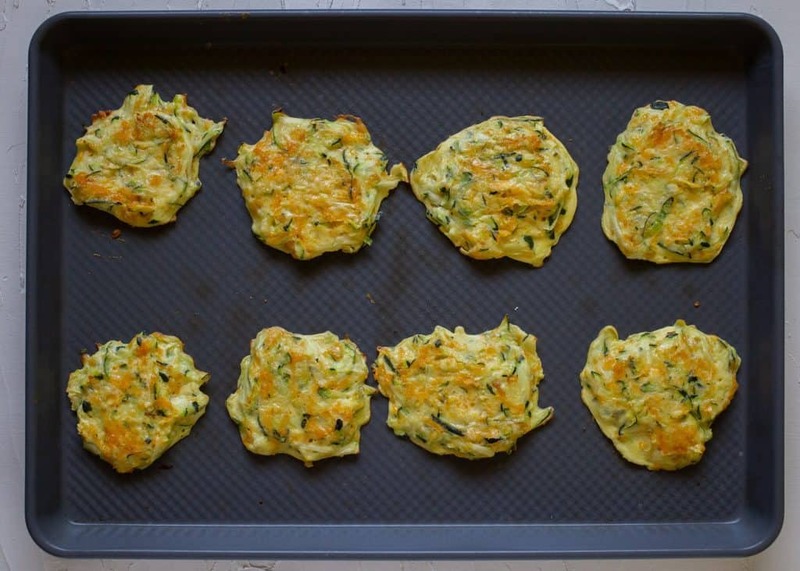 Zucchini fritters are a household staple. I’ve made them every summer for years to use up the zucchini crop from our garden. Pan-fried zucchini fritters is a meal that I always think will be quick, since the batter is so easy to whip up, but then I end up standing in front of the stove for a long time making three at a time in our skillet until way past dinner time. I loved the taste, but not the time it took to make. 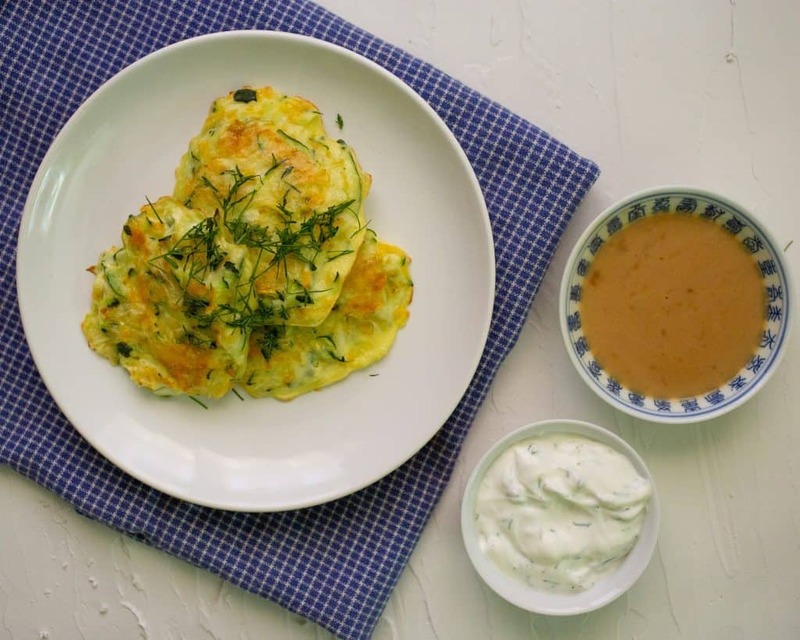 This year I thought I’d try to make a baked version of these zucchini fritters. By baking, I turned hands-on stove time into hands-off oven time. 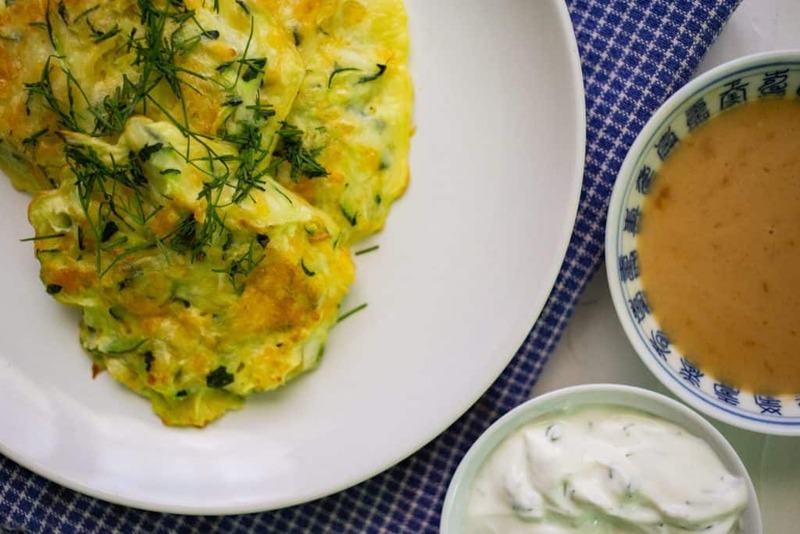 Now these fritters are super easy and tasty! I tried these out with two different dipping sauces: a creamy soy dipping sauce and lemon dill sour cream. Make one or both – my family loves to combine the two. To make this a more substantial meal, try serving over rice or you could turn it into breakfast for dinner with bacon and eggs. Start out by grating your zucchini. I used one extra large zucchini to yield 4 cups, you may need 2 or 3 smaller zucchini. Place the zucchini in several layers of paper towels and squeeze gently to remove some of the moisture. Add the eggs, beat with a fork for a minute, then add the flour, salt, and cheddar cheese. Mix together, and then add the zucchini and mix until thoroughly combined. 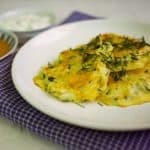 You’ll bake these on a nonstick baking sheet for about 7 minutes, then take out of the oven, flip the fritters, and bake for an additional 6 to 7 minutes. Serve with one or both of the dipping sauces. 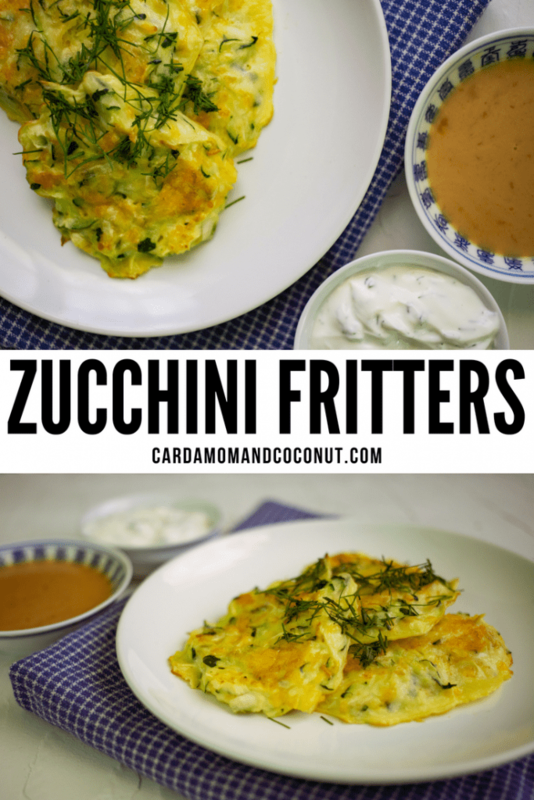 If you try these easy baked zucchini fritters, please leave a comment and review below to let me know how you liked it! Try this recipe for Zucchini Muffins with Lemon Glaze and share your favorite ways to use zucchini below in the comments! 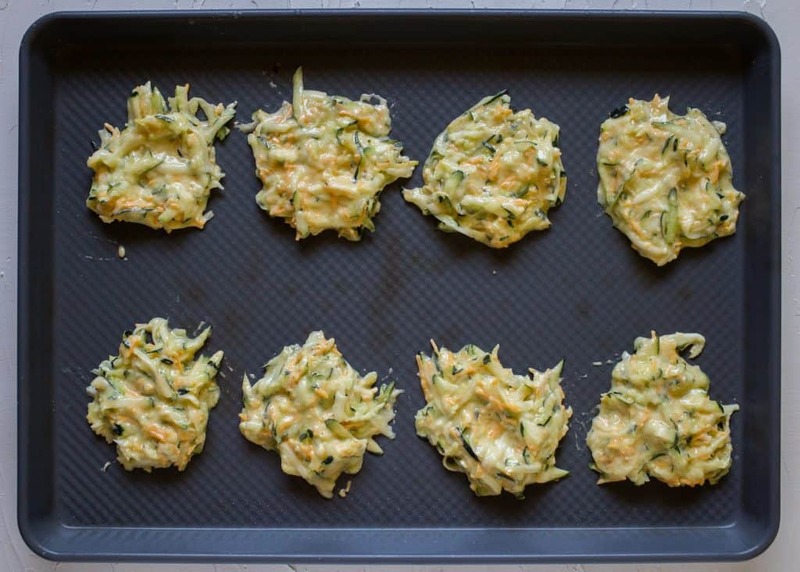 These 5 ingredient easy baked zucchini fritters are the perfect way to showcase fresh zucchini. Place the eggs in a large bowl and beat with a fork for about a minute. Add the cheese, flour, and salt and mix with the fork. Add the zucchini to the mixture and combine. Place about a heaping 1/4 cup of the mixture onto a large nonstick baking pan, leaving about an inch or more in between each fritter. I got about 8 per pan. Bake for about 7 minutes, then remove from the oven and flip the fritters over. Bake for another 6 to 7 minutes until golden brown. Mix the soy sauce, vegetable bouillon, and water in a small bowl. Add to a small saucepan and bring to a boil, stirring frequently until thickened. Then add the cream and set aside. Mix together the sour cream, dill, lemon juice and salt in a small bowl. Love this idea for breakfast! Zucchinis are great!! I hear the word fritters and I come a running! I am going to have to try your amazing recipe. These look so good! Yum! I love the sound of these fritters. Both of the sauces sound delicious, and I always like serving a few options. Perfect. I love that these are baked! 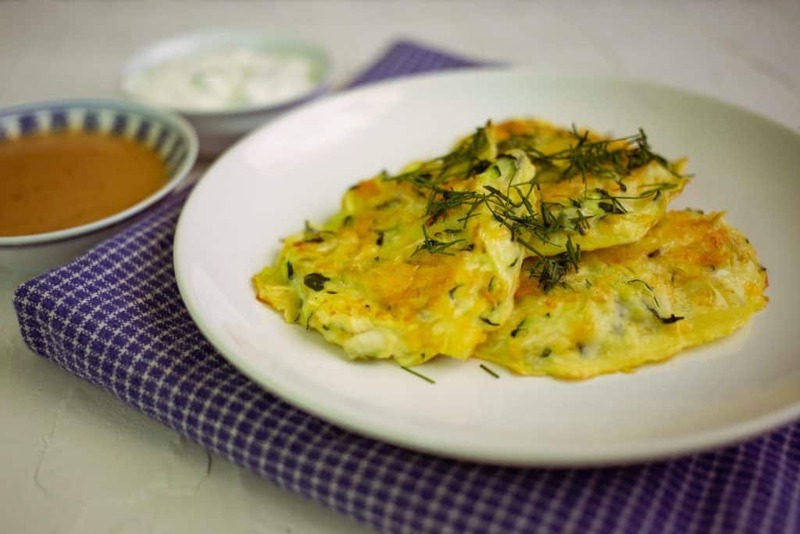 I love fritters but sometimes they can feel a little too greasy in all that oil so these are perfect!